I made it for Ellie because I wanted to do something similar to the pink and white sweater I made for Mimi but didn’t feel like knitting the exact same pattern twice. It’s nice enough but didn’t turn out quite as I’d hoped. I don’t know. Ellie looks very sweet in it but I don’t think it’s something I want to publish. 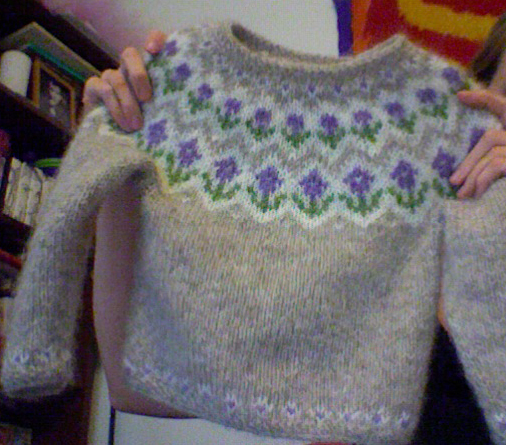 I haven’t even knitted it yet and I’m already kind of obsessed with it. After designing three rather unorthodox lopapeysas, I wanted to make something more traditional. It was an interesting challenge to come up with something that hadn’t been done before but which still looked very classic. I can’t wait to see how it turns out! 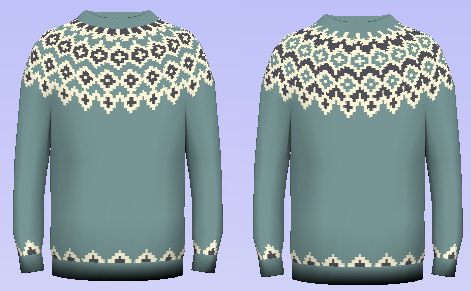 If it all works out I’ll make the pattern available here, hopefully in a range of sizes. I can’t decide which colour configuration I like better. Thoughts? Left or right? I think I’ll probably knit one for both girls so I can see it both ways. I hope I finish it in time! Categories: Knitting | Tags: children's knitting, design, Fair Isle, knitting, scarf, sweater pattern | Permalink. 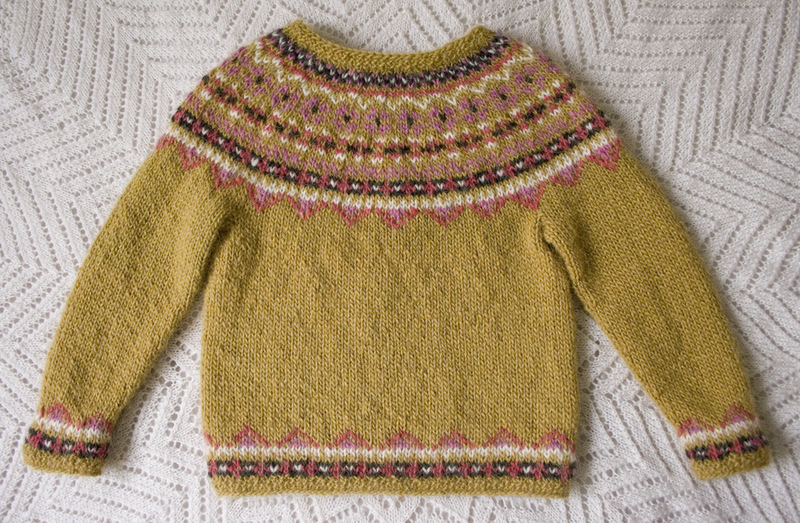 It’s an Icelandic lopi wool sweater, also known as a lopapeysa. Lopapeysas are extremely popular here in Iceland. Most Icelanders have at least one. They’re cosy, durable and water-resistant, perfect for the Icelandic climate. My kids wear them every day in the colder months. I designed this pattern myself using a wonderful website called knittingpatterns.is. I’m making it available free of charge. You can queue it on Ravelry and pin it on Pinterest. It’s currently available in English and Icelandic (update: now in French too!) and I may add some other languages later. If you have any language requests, let me know! “Fimma” means “fiver” in Icelandic. I chose the name because it’s knitted with five colours – most lopapeysas use between two and four, usually monochromatic. Léttlopi wool comes in so many beautiful colours, it seemed a shame to stop at just three. 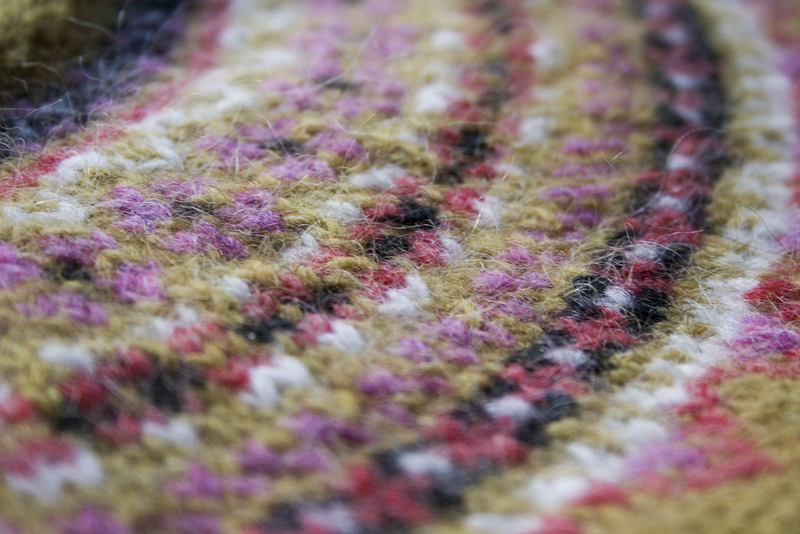 Don’t be intimidated though – the knitting method is essentially the same as with any other lopapeysa. I designed it so that you’re almost never knitting with more than two colours at once. In the few rows that use three colours, just be sure to keep the strands at the back extra loose to prevent bunching. For what it’s worth, I’m a pretty clumsy knitter and I had no trouble with it. It’s a lot of fun to make! I loved seeing each row of pattern forming as I went. – I knitted the collar and ribbing a little differently to what it says in the pattern. The size 6 pattern tells you to knit 3 cm of ribbing; I did four rows of seed stitch instead. You can do it however you prefer. – With the exception of the main colour, the pattern requires less than half a ball of each shade, so it’s a good pattern to knit if you have a bunch of half-used balls that you want to use up. 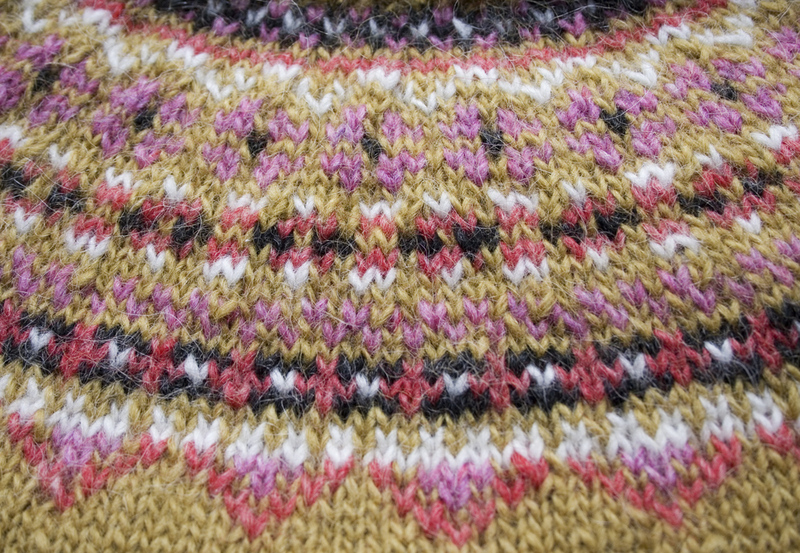 – If this is your first time knitting a lopapeysa or doing colour-work, it’s worth mentioning that you need to keep the tension of the multicoloured parts a little looser than the rest of the sweater, otherwise it gets a bit taut. Some people do this by switching to slightly larger needles for the multicoloured parts. So in this case, you’d go up to 5.0 mm (US 8) needles. I’ve never done it that way though, I just knit a little looser with my 4.5 mm (US 7). – Fimma was designed to be knit with Léttlopi wool but it should work with any Aran/Worsted Weight yarn. – The pattern is unisex. If you don’t want the flowery motif to look like a flower, knit it in green and BAM! It’s a 4-leaf clover. – This pattern is available strictly for non-commercial use only, unless you have express written permission from me, the author. Thanks for taking the time to look! If you need any knitting help or have any other questions, ask in the comments. This is my first time releasing a pattern so if there’s anything important I’ve left out, please let me know. 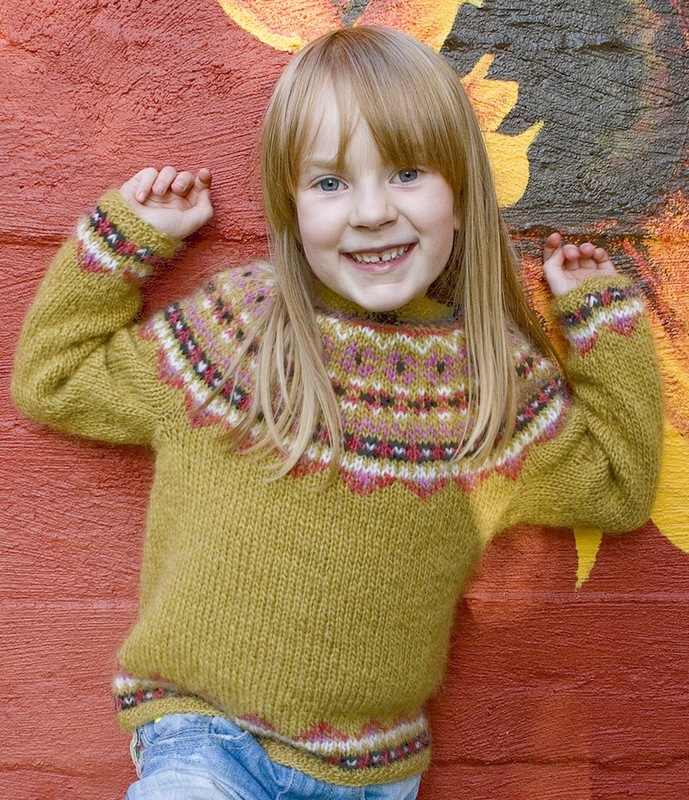 Categories: Iceland, Inspiration, Knitting | Tags: children's knitting, clothing, design, fashion, free knitting pattern, kids, knitting, lopapeysa, style, sweater, wool | Permalink. I’m an Australian woman living in Iceland with my two daughters, “Mimi” and “Ellie”. 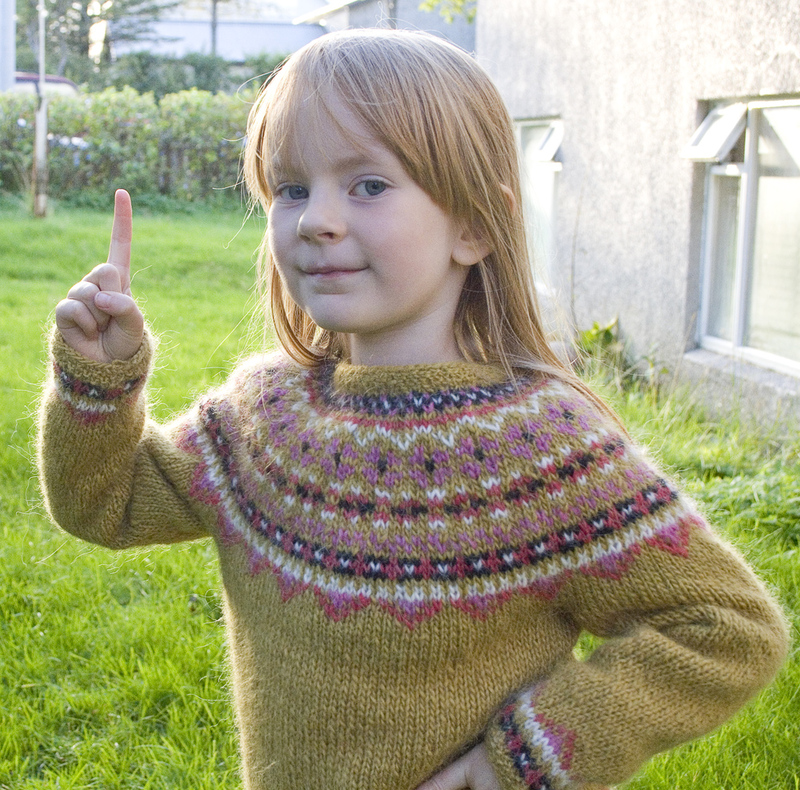 I blog about knitting, art, parenting, and my life in Reykjavík.